As an update to Waring's MX1000XT, the Waring MX1000XTX Xtreme high power commercial blender is ideal for smoothies, bar drinks, soups, salsas, desserts, dressings, and more. This commercial smoothie blender boasts a 3 1/2 hp motor capable of 30,000 RPM on the high setting, and 45,000 RPM when using the pulse setting. Easy to use paddle controls are clearly marked with high, low, and pulse so that you can adjust the speed. Love this blender! It is so much quieter than our last one. It mixes anything you put in it in just a matter of seconds and it's very durable. The pitcher is very lightweight also. This is a simple machine which can outperform any of the competition if used in the right way. There aren't a lot of frills on this guy: two speeds and a pulse function. He also runs extremely loudly, but the power and effectiveness of the engine can blend through anything if properly used. The Waring MX is cheaper than the fancied up Vitamixes and Blendtecs, but the machinery behind the blender and stand up to and exceed both. If you don't mind a kind of clunky, noisy machine,this is an incredible bargain. After MANY HOURS of research that included reading reviews, sorting through countless customer comments, and watching way too many videos on various blenders, we decided to go with the Waring MX1000XTX for our busy restaurant's bar. Our verdict after about a week of use? Stop your research and just get it! The first day our bartender prepared our signature 48oz Mexican Bulldog (frozen Margarita with a Corona inverted into it)...in less than FOUR SECONDS--with no bits of ice, in the presence of two die-hard blender fans and they were blown away. No joke, it looked like a majic trick. And those who complain that it is loud must be using it to make smoothies in a closet at 5:00 in the morning! The 64 oz container is a great size for our bar. It will blend one 12oz drink or a full pitcher with the same ease. Now our kitchen staff wants one as well. And you can't beat the great price and service from Webstaurantstore. We couldn't be happier with this blender. Its hard working and after a year of use still works perfectly well. I like the way it blends everything very finely, doesn't leave big chunks and makes smooth sauces. The cord is also long - I wish all appliances came with a long cord like this. This thing is a beast! Did a ton of research online before buying this thing...and finally settled on this one and I couldn't be more satisfied. Simple, straightforward operation and raw power combine to give you a blender that can blend pretty much anything to a smooth consistency. I use it for smoothies.Warning! The blades are sharp! It will fit under the counter IF you leave the lid off. We have owned this blender for several years and can't say enough about it. It is an absolute workhorse at our restaurant's busy bar. I just can't see paying several times it's price for other brands that aren't nearly as powerful. As with any product, some who have left negative reviews may have received a lemon. BUT...Webstaurantstore does an amazing job of taking care of issues. We have always been extremely satisfied with their customer service and prompt response to questions/issues, no matter how minor, and that is a big part of what keeps us coming back. You can buy this blender with no reservations. Great investment! I'm torn on writing and rating this blender. On the one hand we really like how they work and the power they have. They easily blend smoothies and sauces. That is while they are working. We do about 30 smoothies, a day with the blender 5 days a week. In 4 years, between this one and the next step up, the MX1200 we've had 4 or 5 warranty returns withing a year. Fortunately those were covered and we received new units. Two other's we've had lasted about a year and a half before breaking out of warranty. We blend according the the manufactures instructions. It's seems for the price of the blender of this power that they should last longer with the use we put them through. For a blender that is rated for 75+ drinks a day I'm disappointed to say the least. These may last in a residential situation, but they just don't seem to hold up even to light commercial use. Unfortunately we're no long able to recommend these and will be looking for another manufacturer for our blenders. We appreciate your review, Adam. We wish this Waring MX1000XTX Xtreme 3 1/2 hp Commercial Blender with Paddle Controls and 64 oz. Copolyester Container would have worked out for you. Our Customer Solutions team will remain in contact with you about this. This thing is a beast! Crushes ice to snow on low in mere seconds. I don't know why I did not purchase this sooner. This blender beats out every high end blender on the market. It blends vegetables for soup (broccoli cheese, tomato) so well that I don't need to add cream, its so incredibly creamy and smooth out of the blender. It's very quick, you can make peanut butter or other nut butters without feeling like you are straining the motor. It powers through it without any extra effort, slowing down or grinding noise. If you are looking at vitamix or anything else there is no comparison. Waring is the way to go. Also Webstaurantstore.com is super fast shipping. I believe I received my blender the next day. Blender was used 5-7 times a day for fruit smoothies and stoped working in a 3 month. Customer service promised to reply back to me in 48 hours but noting happened. Very disappointed. We appreciate your review, Oleg. We wish this Waring MX1000XTX Xtreme 3 1/2 hp Commercial Blender with Paddle Controls and 64 oz. Copolyester Container would have worked out for you. Our Customer Solutions team will remain in contact with you about this. Replaced control electronics twice in 18 months. No warranty support since I shipped it out of the US so I am stuck paying $100+ for the part plus shipping. Would not recommend. Best blender. I use it for slashing fruit and vegetables for juice. It is about 200 dollars cheaper than other seller. Great buy in general. This Waring MX1000XTX is well worth the price! It is strong enough to chop through I cubes and makes fantastic smoothies. It's a great value! Very powerful blender. Paddle controls give a lot of control to the user. Soft start on the speed control paddle, and instant power on the pulse button. Pour spout is very helpful. Simply put, this thing is a beast. Makes easy work of the constant flow of frozen cocktails coming out of our bar. Hesitated to buy a second jar until we tested the blender, and ended up getting a second jar right away. Save yourself the hassle and order a second jar from the start, as this blender will not disappoint. This blender rocks! We make a lot of blended margaritas and this really gets the job done, and quick. The multitude of uses for the blender is also what blows me away. We have done everything from grind coffee to make soups with this! This commercial blender works great for our thick milkshakes and malts. The motor went bad while still under warranty and Webstaurant was able to ship me a new one within the week. This is an awesome and powerful blender. The gradual ramp up of the speed is great so it doesn't spray liquids all over the container. Considering this is more powerful than a Vitamix i think this is totally worth it especially considering it is less than half the price. For smoothies at home the i only need 2 speeds. An infinitely variable speed control feature is something that I don't think i ever need. The only problem i have with this blender if that the paddle switches on the front are easy to hit by mistake. I keep the blender on the counter since i make smoothies daily so i frequently knock the ON switch on by accident. Thankfully with the gradual speed ramp up of the motor I hear it speeding up it and turn it off before it gets going too fast. Even with that I would still recommend this blender over a Vitamix any day of the week and twice on sunday. Best thing I've purchased for my kitchen. Makes smoothies, sauces, whatever creamy and silky without fail. If you love smoothies, making soups, and sauces in your home kitchen or commercial, this is a great investment. We were torn between this and a popular competitor. We have not been disappointed in our decision. We sale a lot of smoothies that come frozen and the Waring just chew right through them without any difficulty. I had thought about submitting a video, but they require the video to be 30 seconds long and after the short 5-10 seconds of turning a block of frozen ice and fruit into a drink I didn't want to stare into the camera for the other 20 seconds. We use this for all the workhorse blending and could not be more pleased, It doesn't come with a tamper but guess what, a standard tamper we found will do just nicely. Love this blender. We bought it to make Frappes in our small bakery. It pulverizes 2 cups of ice in less than 5 seconds. Would buy it over an over. This is THEE BEST commercial blnder! I use this in my home as I burnt out several before purchasing this one. I use it to make smoothies every morning, using frozen fruit this things grinds and blends them up with ease. The first time you use it you will hear and feel the difference from crappy cheap blenders...this one delivers the POWER! Amazing! Thisis definitely the best blender we have ever owned!! Frozen drinks, licuados, shakes, pureed soups, salsas, refried beans, we use it for pretty much everything with no problem! I bought this for home use to make smoothies and other pureed foods because a standard home blender just doesn't get the right consistency. It is incredible! The end result is just what I wanted - when I make green and fruit smoothies I don't have lumps or shreds or ingredients floating in the glass - it's all really "smooth." In lieu of using my food processor I made mashed cauliflower and apple in the blender and the consistency was better than the processor. The jar that comes with this is 64 oz, and that was a little large for daily use, so I also ordered the 48 oz jar. The base and the smaller jar fit in the appliance garage on my counter, and make it convenient for daily use. You can buy the version that has the electronic power buttons with the 48 oz jar, but I wanted the toggle power source, which only comes with the 64 oz jar. It cleans very easily. Well worth the money! Very powerful but a bit too noisy. We have been using this for frappes and milkshakes and has worked perfectly well. If you don't mind the noise then I will definitely recommend. We bought this blender for my mom. She loves it. She makes a smoothie in it everyday. It is easy to clean and it is keeping her healthy too! Great blender! Is powerful and has no problem making smoothies out of whole fruit very quickly. My one and only complaint is that the blender container doesn't "click in" very easily to the base. I usually have to stop and make sure it's in- which can be frustrating during a busy rush. Other than that, works very well! Very, very powerful blender used at our bar to crush ice for mixed drinks. It's a bit loud, but no noisier than any other blender that I've used and many of those have less power. Really like that the pitcher/container is not heavy glass but a lighter and sturdier plastic product. Love this blender! It is much quieter than any other brand. and the price is very reasonable. you just need to put in the flavors and fruit, and few seconds it done become smoothie. After an extensive research, I had high hopes for this blender, however, it was very disappointing to find out that it sheds small black particles into food. I thought that it would wear off after some use and thorough washing but no such luck. I've purchased an extra container and they both had the same problem. If you search for blender shedding online, you will learn that Waring is not the only one with the problem. Overall it's a powerful machine and I wish the company would fix the issue with the blade assembly. On a positive note, WebstaurantStore customer service was amazing. I had few phone conversations with them while trying to resolve the problem and was able to return the product without any issues. Blender quit after 2 months of very little use. Just coming into frozen drink season and started using it a few times a day, getting a refund hopefully. I've been waiting 2 mos. for a refund on sales tax so who knows. Thank you for the review, Troy. We apologize that this blender has given you issues! A Customer Solutions Representative will be in touch with you to resolve this. This is a powerful, fabulous blender! I was also looking at a Blendtec and after doing the research, this models seemed like as good (if not better) and was less expensive. I highly recommend this for home use. 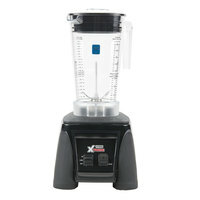 I bought the Waring MX1000XTX Xtreme 3.5 commercial blender as a back up to my blender. My Blender works great but the Waring Xtreme has the same size motor so I tried making a smoothie using the Waring Xtreme. It didn't skip a beat in a matter of seconds I had a smoothie with not a piece of ice. You don't need to spend a lot for a good blender. The Waring Xtreme will do the job and its NSF Certified. Stick with WAring and the service you get at Webrestaurantstore.com and you'll get the best price. We have been very Pleased with this product. Seems Comparable to other "name Brand" fighting blenders but seems very industrious. The motor is a little scary when it starts. It makes my wife nervous, it just sounds Powerful and Solid which is what we wanted in a blender. It also blends like Crazy! We purchased this in order to add smoothies to our menu. This blender is a strong blender that will be around for a very long time! Great product for a great price. Product showed up ahead of schedule. I would definitely recommend this product to anyone and I will be buying more. I've been using this blender for a couple of months and I can say it is super resistant, and the blades can take a lot of work. easy to clean and simple buttons, I couldn't ask for anything else. Great blender for the price but after 6months of commercial use the jar started to leaking at the bottom where the bolt was but got a replacement fast with no charger webstaurantstore is great and service is fast. We have been using this blender pretty much daily for the past 5-6 months and .... we LOVE IT! it's on the heavier side, but not too bad. It's what you get from a product with a solid build. It's loud! But we expected that from a machine that revvs up to 45,000 RPM. It crushes and blends anything you throw at it in no time. It takes 15 seconds to make a perfect smoothie. When we first made a fresh strawberry smoothie I noticed that I could not feel any seeds. This beast pulverized them. I had no idea a blender could do that. Our old residential blender could never do that. Love this blender and wish I bought it a long time ago. Very good quality... I have few of this item for smoothie, sauce, dressing, little bit noisy. But worth of money for this quality. High recommend. This is the only blender to get. Way pay lots of money this 3.5 HP unit works wonders and is far superior than any other. So, this thing is AWESOME! We've been making Jams and Jellies for years. Have used many different brands of blenders, and this one tops them all. Super fast, efficient at actually mixing your product and TONS of power to chew through whatever you put in it. 5 Stars from us! This was a hard review to write because after the first time I used this blender I was speechless. This blender is amazing, blends anything I throw at it. Hot or cold, you name it and it will blend it. Fast, smooth and not too loud. Every restaurant and home should have one. We make our own peanut butter and almond butter at our store, and this bad boy is perfect for the job. When summer finally gets here, I'll see how it does for smoothies. If it is as good as I suspect, I'll definitely be purchasing another! I got this blender so fast i freaked. Really fast and powerful blender to have if you are serious smoothie maker. For the price you are paying you cannot go wrong with it. Just buy it you will be happy. Use this everyday and it is absolutely super. Good quality, easy to clean and will blend almost anything. Thought I needed the dial feature but have been very satisfied with low,fast and pulse. I have purchased this blender about 1 year ago. I didn`t want to write a review right away, wanted to see how it worked. I use this blender mostly to make crumbs for my cakes. It makes crumbs in seconds. I am very happy with this blender. This is a great blender. The blender has plenty of power to provide ultra smooth smoothies. The blender is easy to operate and is a good value. This a great blender, plain and simple. Guaranteed satisfaction, this is a versatile product that can puree anything from a hearty soup to a loaded smoothie, until velvety smooth. Very satisfied! We use this blender for smoothies and Blenjava's, which is a blended milkshake drink. Both of these require ice to be blended and it works GREAT! For twelve years we've been serving smoothies made from our Vitamix blenders. I decided to give this Waring a try because of the larger motor lower price. Wow! The Waring is quicker and blends more thoroughly than the Vitamix. Our staff uses the Waring all the time and they asked me to buy another one so that we can retire the old Vitamix blenders. By next summer I'm sure we'll they'll have their wish. Good product. Easy to clean. Powerful. Nice large 64oz blender on it. Great for bar and kitchen, and at about a hundred bucks less than a VitaPrep, easy on the wallet!!!! This is great. Just as good as the vita-preps, and at a lower price. they make perfect purees, great for soups, sauces, anything really. This is a great blender ! It is used heavy duty in our restaurant to make smoothies and it never fails. would buy again ! Great blender. Super simple with very few buttons, but very powerful. Chops chocolate chips, pecan, walnuts, and ice with ease. Great for mixing thick milkshakes. This is a very high quality blender!! Just as good if not better than the common vita-mix brand!!! Blends with ice and solid food easily!! This is a 5 star product for me. This blender is extremely powerful and works fast, even at the low setting. The 64oz container/cup size makes it great for soups and sauces. Highly recommended. Very effective at pulverizing ice; sturdy construction ensures the machine, especially the container, will not break. Even when dropped, the container did not break. Recommended for any bar. this a great product.. works terrific. we make our own sauces for the meats and this blender is awesome. Couldn't ask for a better product. This blender is expensive but so far pretty great. It is very tall at 18 inches but constructed of metal in all the right places. Worth the expense and hopefully will outlast any other blender I have had. A powerhouse of a blender, fast and efficient. A little noisy, but I would recommend this blender very highly. The container is light and seems very tough. This blender is great! We use it everyday to mix our sauce recipes and we use it for a lot of our wing recipes too. Couldn't ask for a better product. This is one of the best purchases made. It blends everything for smoothies really fast including the ice. It is extremely easy to use and clean. I bought two! Stand back.... this thing is awesome! Great Blender and what a deal! I checked out several 3 hp blenders and could not find one at price close to this. I just got this one on Saturday and have had smoothies every morning since it arrived. This blender chopped an avocado seed with no problem and turned hazel nuts into dust in my smoothie. I couldn't be happier! I did a lot of research before buying this item. I have used this blender for 10 months now. I have not had any problems with this model. I love it and use it daily. I have used mostly for green smoothies but have also used for creamed soups and juicing. It is powerful and will blend anything in seconds. The container is a good size, and has not had any discoloring or wear shown. It is easy to clean. I fits on my countertop under my cabinets. I am overall very pleased with purchase, and would recommend to a friend (in fact I have). I also would recommend Webstaurant store to buy from. They were very professional, quick to deliver and had great communication.